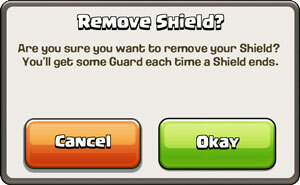 The Shield is one of the General elements of the Clash of Clans game. Automatically after being the victim of a successful Raid (40% and above or Town Hall destroyed). You will lose all of your shield, even if it’s purchased with Gems, regardless of remaining time if you decide to attack another player. If you currently have a shield and attempt to begin a multiplayer battle via the “Find a Match” screen, you will get the message “Shield is active — Attacking other players will disable your shield, and other players will be able to attack you. Are you sure?” If you click “Okay,” your shield will be removed regardless of whether you actually initiate the attack. If you have a shield and attempt to use the “Revenge” feature within the battle log, you will not break your shield until you confirm the attack via the “Shield is active…” message and actually visit the village through the clouds (i.e. if your opponent is online, has a shield of their own or their village is under attack, you will not lose your shield). 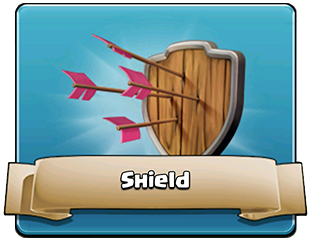 Attacking in the Single Player Campaign or Clan Wars will not remove your shield. Upon being successfully raided, you will be granted a temporary shield from attacks. This is to prevent farming and rapid loss of Trophies and/or Resources. When 40% of your village or your Town Hall is destroyed in a raid, you will get a 12-hour shield. When 90% or more buildings are destroyed you will get a 16-hour shield instead (these two shields cannot be stacked together). 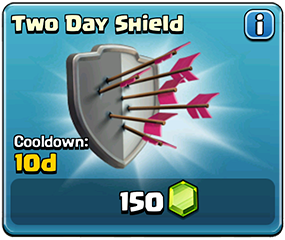 You get a free shield courtesy of Supercell, during and after a maintenance break, for a short period of time. Note that you do not necessarily have to lose a battle to gain a shield; if your opponent destroys between 40% and 49% of your village without destroying your Town Hall, you will gain a shield as well as a defensive victory. When you start playing the game you get a free 3-day shield, which you should use to get started. Your 3-day shield is a good time to upgrade your Buildings. If you purchase a shield while you have one (of any source) currently active, the purchased shield time is added to your current shield time. If you purchase all three shields simultaneously, you will be able to re-purchase a second two-day shield and two additional one-day shields before the end of your shielded period, as the cooldown period on the shorter shields will have expired. This way, the maximum continuously shielded period available via purchase is 14 days ([day 1] 1+2+7 + [day 6] 1 + [day 11] 1+2). This 14-day shielded period can be purchased every 35 days (the time it takes for the 7-day shield cooldown to reset). Note that if you execute this during a 16-hour shield received from a 90%+ attack or a 12-hour shield received from a 40%+ attack, you can actually increase your total shielded time to a maximum of 14 days, 16 hours, or 14 days, 12 hours, respectively. Also, if you do this during the three-day shield you get when you start the game, you can have a maximum of 17 days on your shield, which, again, can be executed thirty-five days from your purchase of the one-week shield, or eighteen days after the cycle is complete, but it will only last for 14 days (and maybe an additional 12/16 hours). If two additional shields of any duration are ever added (with standard cooldown times), it will be possible to stay shielded indefinitely. 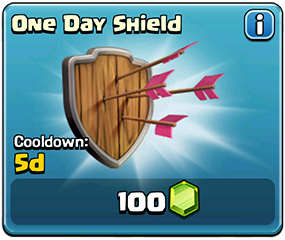 You cannot buy 7-day shields above 4700 (i.e. in Titan I and Legend League). Every purchased shield has a cooldown time. The longer the shield lasts, the longer the cooldown period. This was added to keep people from staying shielded indefinitely by continuously buying shields. The cooldown period is calculated by multiplying the number of shield days by 5. 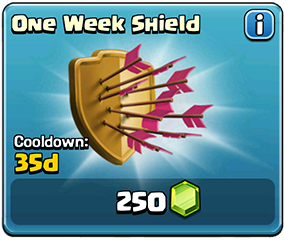 For example, the 1-day shield has a 5-day cooldown, the 2-days shield has a 10-days cooldown, and the one-week shield has a 35-days cooldown. Continually buying each shield as soon as its cooldown has expired will result in an average of 21 shielded days every 35-day period (60%), although this will vary from period to period (22 the first, 20 the second, 22 the third, etc.) because the 2-day shield’s cooldown will only line up with the 7-day shield’s cooldown every other period.